24option is a leading binary options specialist which offers award winning trading software. Their customer services team are available around the clock to help with any enquiries, and the site also offers a range of educational videos and webinars to help improve your trading decisions. They are a widely recognised online trading company, having recently joined forces with Juventus football club. It’s important to remember that binary options are high risk trades which can result in losses. A leading binary options specialist which offers award winning trading software. The first thing to know about 24Option.com is that it’s a binary options trading service. This means that as they specialise in delivery world class binary trading, you don’t get quite so much variety when it comes to how you approach your trades. Not sure what binary options trading is? Well the website goes into some detail to describe binary options, and the slight variations available to you within that fence. We've some more details about binary options towards the bottom of this review. 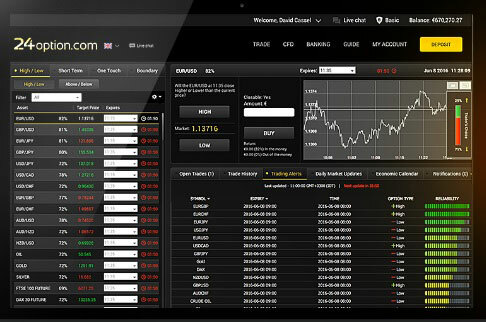 User-friendly platform displaying a variety of useful trading information. The next important thing to think about is the trading platform provided by 24Option. This is a multi award-winning trading platform which works on a variety of desktop and mobile devices. This is handy because it means you won’t lose on deals just because you’re not near a computer. The platform can show you a really useful amount of information on a single screen, so you can contrast and compare data to make a more informed trading decision. The website doesn’t say a great deal about its prices and fees, so we spoke to their customer services team. They were very helpful and efficient with information, highlighting that the service is commission free, but you are charged when you withdraw capital. This cut depends on the method of withdrawal and also due to the kind of account you have. When you first sign up you’ll be given a basic account, but you can lower your charges by trading and upgrading your account over time. This means your profit cuts will be lessened, which is useful if you’re making a lot of money. Whilst some trading websites allow you to explore their software and services without a deposit, and some require just a small deposit, 24option.com asks for a minimum deposit of £250. Whilst this might put a few people off, the exclusivity means that 24Option's customer service team are better able to deliver excellent support to everyone who chooses to cross the threshold and explore 24Option's world renowned online trading service. One could think of it as being like an exclusive club with a higher than average entrance fee which helps to ensure that the customers get top class service once inside. After logging in, you can see instant updates on a select few trade prices, plus a useful glossary of binary options trading terms, which outline the differences between Call and Put options, strike price, target price, expiry time and payoff. This is all extremely useful for novice and advanced traders alike. Check market changes in an instant. In short, binary options allow you to make or lose a set amount of money, depending on how well a market or item performs. For example, you might invest $500 into metals. If the price of metals rises above a pre-arranged price, you will earn a set amount of money (let’s say, $750) but if it falls then you can lose it all. As it’s an “all or nothing” approach to investment, you know the amount you might lose or earn before getting involved. Knowing the best and worst case scenarios with certainty, at the outset, can be useful in retaining control of one's budget. Binary options allow you to trade on a range of markets, including Forex (or currencies) and commodities, indexes and more. The approach is simpler than on other sites, but if you want a greater degree of control and to be able to respond to (and take advantage of) fluctuations then this might not be the ideal system for you. Still, it’s an interesting way of trading, and can be highly lucrative, so it’s worth reading up on binary options if you’re not all that sure about them. The trading platform is specially designed for binary options, so you can quickly view the relevant trading information in a variety of ways, including graphs. You can also filter results to suit your needs, making this an easy-use system. Knowing the best and worst case scenarios with certainty, at the outset, can be useful in retaining control of one's budget. If you’re looking to trade in binary options, 24Option.com is a market leader in the field and definitely worth exploring. Its trading platform is user-friendly and has won numerous awards, so it’s clearly a great system for binary options trades. Although the binary options trading method deals on volatile markets and is a high risk venture, it is also a relatively simple trading method because it clearly states, at the outset, how much one may win or lose in any trade. This kind of certainty, on best-case and worst-case outcomes, is especially useful for novice traders who wish to retain tight control over budgets. The website does require a higher than average deposit to begin trading, but the top class service one receives after joining 24Option, the world's leading binary options broker, means that the deposit is usually money very well-spent. So why not see what 24Option can do for you?